We are all about education at New Leaf, and we understand that not everyone has the time or money to have a one-to-one with our Naturopaths. We love hosting workshops, seminars and all-day retreats – so check out this page for information of upcoming events. We have presented workshops to groups large and small on Hormone health, fertility, Sprouting, Healthy Eating, Vegetarian Protein Needs, Plant-Based Diet Myths, Women’s Health, Detox, Adrenal Fatigue and Self-Care in the workplace – just to name a few. If you would like Hannah or Sarah to speak at your event please get in touch. 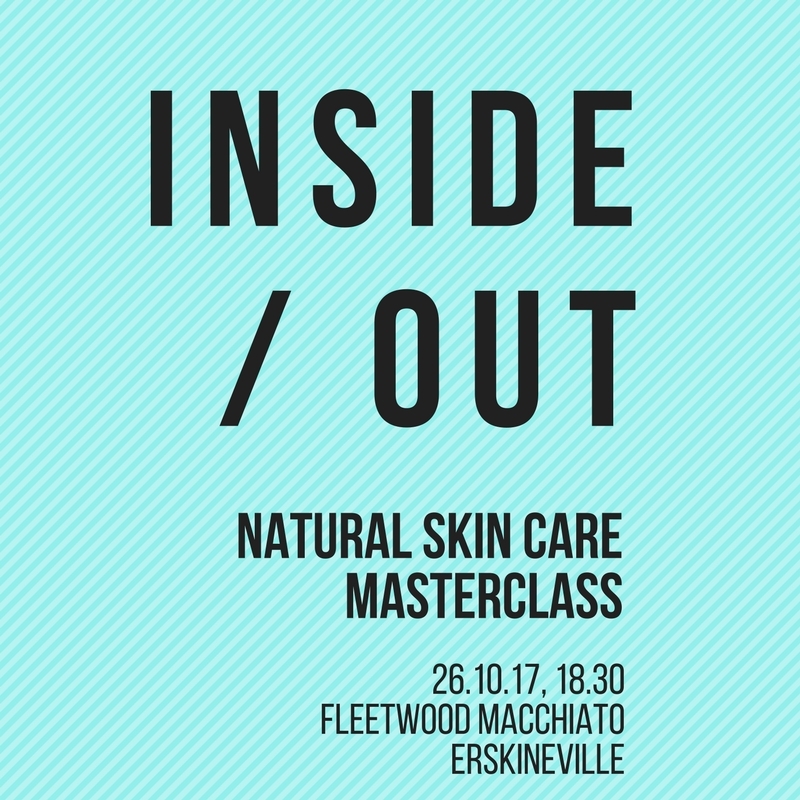 Come along to our next workshop held on Thursdays 26th October 2017 at Fleetwood Macchiato in Erskineville. Naturopath Hannah from New Leaf Naturopathic Health and Herbalist Kyoko from Hello Healthy will help you to maximise your skin’s health – inside and out. This is a master class for exploring natural skin care and making basic skin care products, using everyday ingredients found in your kitchen. You will learn about how your skin works, and the best way to look after it with diet and lifestyle, what natural skin care is and common nasty ingredients you should watch out for and lots more tips. You will make body scrubs and create your own personal face cream to take home. You don’t need to buy expensive skin care products, there are so many ingredients in your kitchen to indulge you inside and out. This will be an Interactive class. We will provide handouts, ingredients, and containers with some healthy snacks and Hannah’s own herbal tea blends. Please bring an apron, glass bowl, measuring spoons, tea towel, mixing spoon and enthusiasm with you. PREVIOUS WORKSHOP: Would you like to know more about the world of sprouting seeds, legumes and nuts? 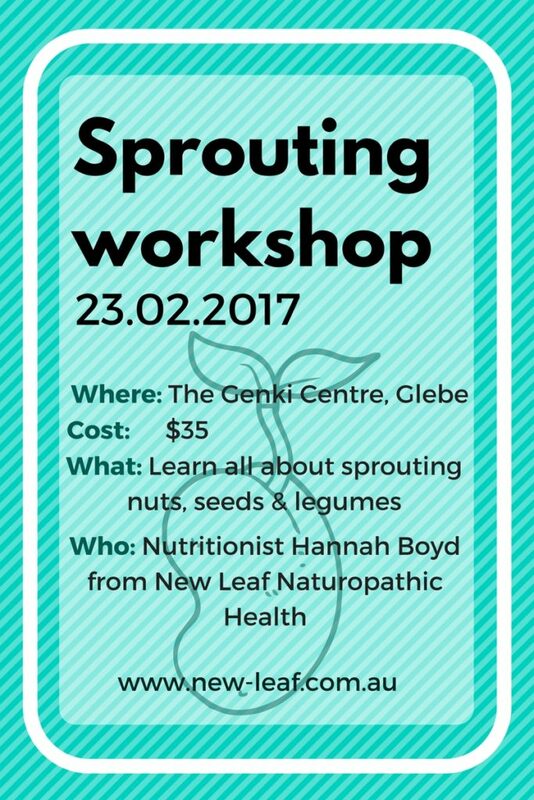 Come along to our next workshop held on Thursdays 23rd February 2017 at The Genki Centre in Glebe. Naturopath Hannah Boyd from New Leaf Naturopathic Health in Marrickville will teach you all about the science of sprouting and why they are a food you should include in your diet. Not only are sprouts delicious, but they are also good for you and more versatile than you think. Learn the difference between sprouted, activated and microgreens in this popular introduction to sprouting. You’ll discover just how nutrient dense these superfood sprouts are, why they’re easy on your digestion and what makes sprouted protein and phytochemicals more readily absorbable. Check out the Facebook Event and book your ticket online HERE. This workshop costs only $35 and will be held at Glebe’s amazing Genki Centre on Thursday 23rd Feb, 2017. Starting at 7.30pm and running for one and a half hours you’ll come away sprouting with ideas on how to use these powerful nutrient dense food every day. Places are strictly limited so book in now to avoid disappointment. Hannah is a naturopath, nutritionist and herbal medicine practitioner. Her clinic, New Leaf Naturopathic Health is based in the heart of Marrickville. She is passionate about inspiring others to have a balanced approach to life through encouraging happy eating, vital health and a happy mind.